First I would like to thank Maybelline for her excellent post and event on my fountain pens. I would also like to express my appreciation on all your positive comments after visiting my website. I allow myself to write down some information on urushi lacquer for those that are not too familiar with it. Urushi is a precious natural material and is the most important material in Japan lacquer art. Only 150g of sap can be collected from each mature lacquer tree over ten years old. In comparison to the world’s annual yield of diamonds which is about 30 tons, only 1.5 tons of the internationally recognized highest quality Japanese urushi can be obtained in a year. Last February I had the chance to pick up 1.5 kg of finest “sakari urushi” harvested in late Summer 2007 in the mountains of Nagano, Japan. Today in Japan, 90% of the urushi lacquer used is Chinese origin, processed in Japan because it cost only 10% of Japanese urushi. The difference between Chinese and Japanese urushi is that Japanese urushi is highly transparent and much more liquid than Chinese, which on one hand allows to brush on thinner coats, which is important for stability, on the other hand it is possible to add more color pigments as a result to have more brilliant colors. Urushi is very robust. An urushi-coated bowl can withstand the extreme temperatures of being used for hot soup every day. Its chemical resistance is also so high that even aqua regalis (nitrohydrochloric acid) which melts gold cannot erode it. Urushi has a hardness of 6 on the Mohs scale, which is the same as that of glass or a stone. Lacquerware pieces have been found that date back 7000 years and the fact that they survived shows how durable urushi is. In Japan urushi is derived from Rhus vernicifera tree. Urushi differs from other varnishes and paint media in that it sets much harder and is resistant to abrasion, all common solvents and even high concentrations of acid. These properties have led to its use as a decorative and protective coating on a wide range of artistic and utilitarian objects, as well as on architectural structures. It can be successfully applied to a variety of substrates, including wood, metal, basketry, leather and textiles, and can be built up into layers of sufficient thickness for carving. Urushi is not drying in the air as other lacquers do but hardens under moist warm conditions. Therefore urushi artists use a drying chamber „furô“, a chamber, with a constant temperature of 25 to 28°C and humidity of 65 to 80%. Coloured urushi is made by the addition of finely ground pigments, but until the 19th century the palette was limited by the fact that urushi reacts with the majority of pigments and turns black or grey. Before c. 1840 the main pigments used in urushi ware were „shû“ cinnabar for red, orpiment for yellow and lampblack or iron salts for black. Azurite was occasionally used for blue and indigo for a darker blue, a mixture of indigo and orpiment or gamboge was used to make green. A red or reddish yellow was sometimes prepared from an extract of afflower and a brownish red from red ochre. Brown is made by mixing a lower proportion of cinnabar with the urushi, although with Rhus a deep, lustrous brown can be produced simply by using multiple layers of lacquer. In the late Edo period the Japanese broadened the palette by developing several new colors or shades, including a good white, which was made by mixing the finest transparent urushi with ground shells or lead white. A wide variety of techniques and materials are utilized in the manufacture of urushi ware, but since the majority differ only in final finish, they are usually treated in seven major groups: carved, incised, inlaid, sprinkled, painted, dry, and gilt. Two or more techniques may be used on the same object, for example shell inlay may be combined with carved urushi or hardstone and bone with painted or gilt urushi. All of these techniques, with the exception of dry urushi, are mostly carried out on wooden substrates. However, metal can be decorated with painted, carved or inlaid urushi, leather with painted and overlaid urushi and basketry with painted, overlaid or moulded urushi. The durability and finish of urushi ware is dependent on the quality and preparation of the substrate, and it is this more than any other factor that determines the quality of the finished product. 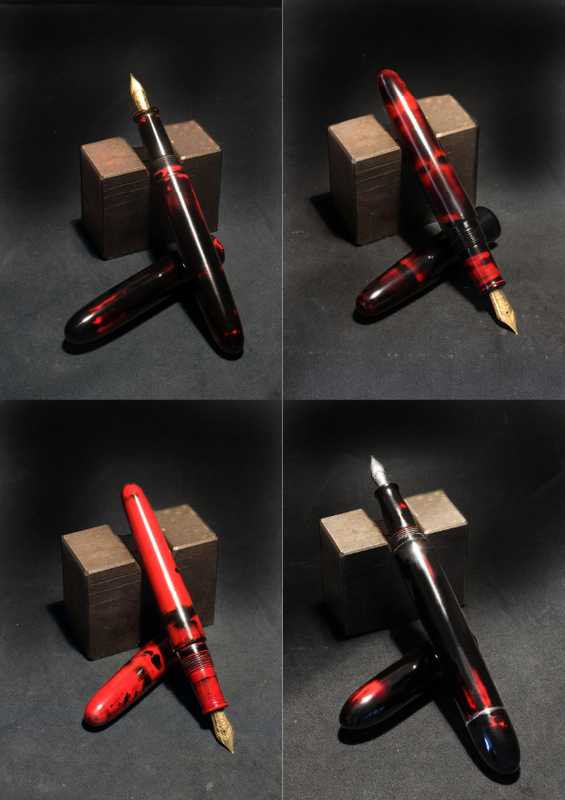 To produce the finest urushi fountain pens, many stages of coating and polishing are required, with a drying period of one to five days between each one. 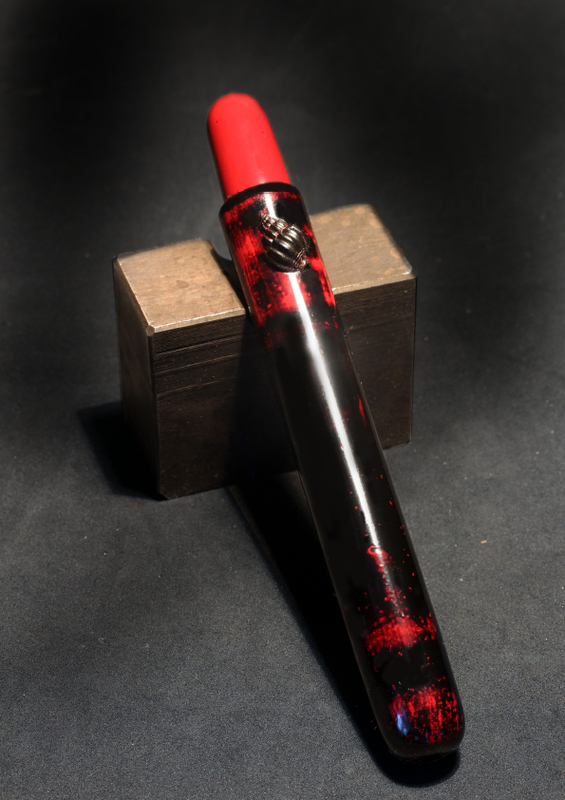 Suikomidome: raw urushi „seshime urushi“ is applied on the ebonite body. Suikomidome: a second layer of raw urushi „seshime urushi“ is applied on the ebonite body. Uwanuri-togi: grind and flatten the surface with charcoal and water. Dôzuri: the surface is smoothed by polishing with a polishing paste a mixture of oil and tonoko powder using a soft cloth. Roiro migaki: rubbing „uwazuri“ highest quality and transparent Kijômi-urushi on the surface, whiped off with a special paper, dried in the furo for 24 hours. Roiro-migaki: micro polish with rapseed oil and finest polishing powder „migako“ and finger tips. Roiro-migaki: micro polish with rapseed oil and „migako“ and finger tips. Roiro migaki: rubbing „uwazuri“ highest quality and transparent Kijômi-urushi on the surface, whiped off with a special paper, dried in the furo for 48 hours. 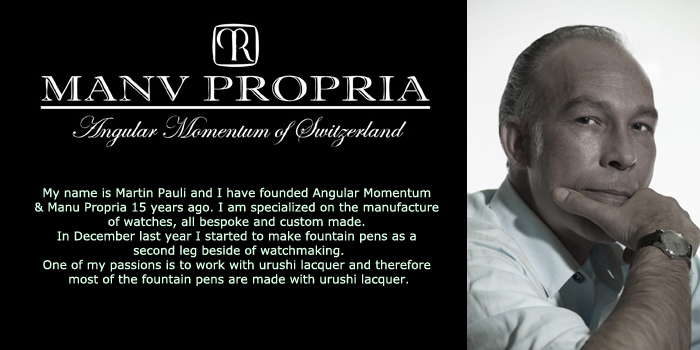 Its been noted, that urushi gets brighter and more transparent with the time and it gets harder with every year. 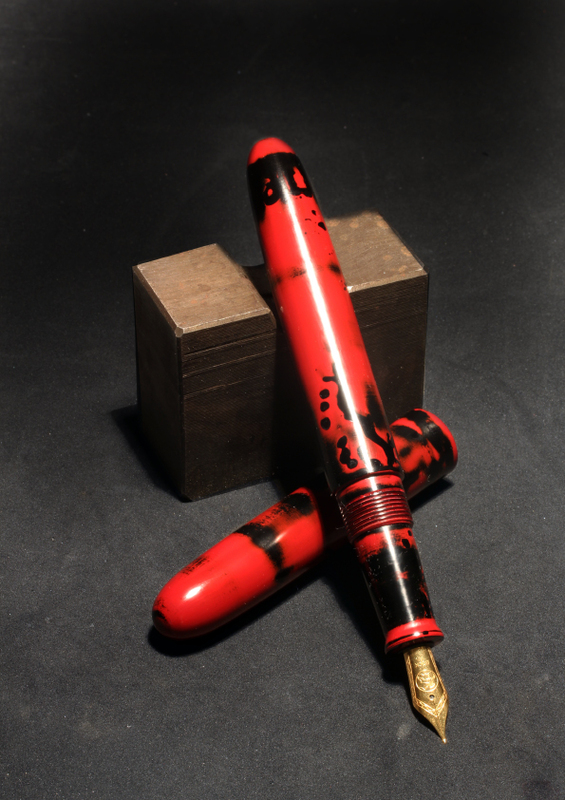 A urushi pen should be used every day but kept out of sunlight to prevent of the color pigments to fade. With the time scratches will appear as on every material less hard than diamond but this is one aspect that improves the beauty of urushi lacquer objects. Red lacquerware with an undercoat of black lacquer covered by a coat of red lacquer or vice versa used as vessels for food and drink offerings to the gods and buddhas, tableware and drinking vessels, tea utensils, and stationery came to be known as negoro. This appellation originates from Negoro-ji, a temple in Kishu domain (now Wakayama Prefecture) that was extremely prosperous from the Kamakura to Nanbokuchō period. During the siege of Negoro-ji in 1585 by Toyotomi Hideyoshi (1536–1598), the temple was set to flames and the artisans who escaped purportedly spread the lacquer technique of negoro to various parts of Japan. After long years of use, the red lacquer on the surface of negoro ware wore away to reveal a black layer underneath. These lacquered objects, which revealed their beauty over time, were highly prized by tea practitioners and art aficionados. 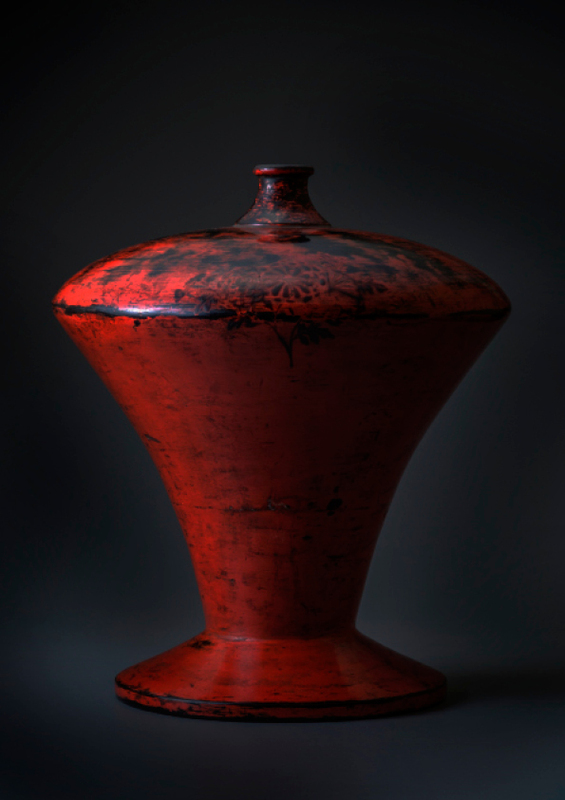 Negoro—which possesses the mystique of a solid, practical form, the distinctive colors of red and black, a soft lacquered surface, and the warmth of a wooden base—embodies the beauty of early Japanese applied art. Today negoro objects fetch highest prices on auctions, many of them more than 1 million dollars. Urushi is one of the most beautiful material to be used for jewelries and the likes. I have seen one of its adorable and elegant output from my very eyes and I can’t stop but drool on that precious design. Will surely buy one soon. I am building a replica of a history (1830s) Hawken muzzleloading rifle. I wish to finish the wood with a black lacquer that may have been used during that period. The finish on the originals is described as black lacquer. That lacquer penetrated into the maple wood up to 1/8 inch. Is it possible to thin urushi as to apply a thinner layer or get it to absorb further into wood grain? What is used to thin it? How much can it be thinned? Thank you Shirley, glad you like it! You are welcome to write a guest post too!